I don't mean it as a put-down in the slightest, but I didn't exactly jump out of my seat when I found out that Al Stewart was coming to town. Unlike some of the artists I've seen in the past—such as David Bowie, Alice Cooper, Brian Wilson and The Rolling Stones—I confess to not knowing Al Stewart's material terribly well. There's really just one album in his repertoire that I've listened to dozens of times, and that is Year of the Cat. I've treated myself to precursory listens of his other albums, but I'd only thus far made mental notes about them that, sometime, I would like to spend more time with them. However, now that I've seen him live, that mental note has been highlighted and put in bold font. Some of the songs I immediately recognized, and others I didn't. “On the Border” and “Midas Shadow” were two songs that I knew straight away, because they're from Year of the Cat. He also played the title track, of course, because he's obligated to play what's by far his most recognizable hit. (He changed one of the lyrics to—I'm paraphrasing—“I can't believe I'm singing this song again.” Hilarious.) Oh, and you can bet he he also performed “Time Passages,” his second-most recognizable tune. If he didn't, all those affluent old people in the crowd probably would have stoned him with their Rolex watches. Another memorable spoken-word moment of the evening was when Stewart announced that someone back stage had asked him who he thought the worst president in US history was. A split second later, a few douche bags in the crowd screamed “George Bush!” at him. (Holy crap, if there is anything worse than rich people, it's rich people who are liberal.) But no, with a bit of common sense and keeping a foot in history at all times, he said probably the worst president in US history is James Buchanan. After all, he said, George Bush didn't start a Civil War. ...He also said that Warren Harding was pretty miserable, which was when he started to sing “Warren Harding” off of Past, Present & Future. Stewart and Nachmanoff really liked to banter with one another on stage. Truth be told, I had a hard time following what they were saying half the time, and whenever I did understand it, it was a bunch of goofy nonsense. But they certainly seemed to have a fun time saying it to each other! Occasionally, they would let off a good one, which would set the crowd in laughter. At one point, he described one of Nachmanoff's guitar tones as Frampton-esque noise, which was great. Even apart from the banter, the pair did look like they were having fun playing with one another, occasionally engaging in mock staring contests as they were going through some of their extended instrumental passages. My only complaint is I got just a tad tired of Nachmanoff constantly telling us how great he thinks Al Stewart is. He even divulged to us how as a child he used to dream about playing lead guitar for him. ...That's sweet, if it's true, but he'd been touring with Stewart for a few years now, and he hadn't yet gotten the stars out of his eyes? ...Well, maybe he's an enthusiastic sort of person! I guess that means he's the exact opposite of how I come off to people when I meet them in real life. 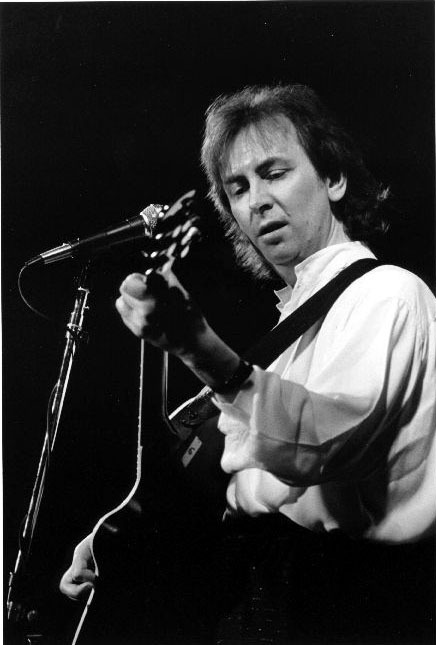 In addition to playing some almost inappropriately awesome lead acoustic guitar for Al Stewart, Nachmanoff took the opportunity to perform about five or six songs from his own career. He has a fairly extensive back catalog, if Wikipedia can be trusted at all (which I do with 100 percent of my mortal being). His songs are usually very good. As Stewart himself even admitted, Nachmanoff has much more of a penchant for writing catchy choruses than he does (to which his greatest fanboy replied, to paraphrase, 'but he writes the greatest verses on earth'). Perhaps his most memorable song was a crowd-pleaser about two people who fall in love online and meet each other in real life for the first time. (The lyrics are filled with playful Internet lingo.) The pair also apparently collaborated on a song, which they said they just finished the previous night. For sure, it was one of those songs with catchy choruses, and they wanted the whole crowd to join them in singing it. I've got to admit, however, I didn't find the song to be terribly wonderful. However, it was pretty awesome to witness the debut of a brand new song! Maybe they'll iron it out better if it ever gets studio treatment? And with that, I say it was a good show! The only thing left to mention was that Stewart was selling and signing posters afterward. The poster reportedly had every single historical character in it that he mentions in all of his songs, which amounts to more than 100 of them. (The guy who apparently designed the poster came out on stage and sang back-up for the chorus of the “new song.” Whenever he sang, he kept on lifting up his right leg like some sort of weird flamingo.) ...I didn't end up getting a poster, though. It might have been fun to see Al Stewart face-to-face, but I've never been into collecting autographs, and I wasn't about to start then (just like he wasn't about to start singing “Three Mules”). I also never know what to say to famous people. ...I mean, I wouldn't have come off too great telling him “I like your music, duerrrrrr!” to which he would have replied in his polite, rapid-tongued, and high-pitched voice “Why, thank you very much, indeed!” It's just pointless living out what I know will be an inevitability in my head. Apparently, Al Stewart coming to the Seattle area isn't such a rare occurrence. He played at a casino last October (which was shortly after I purchased the tickets), and he's coming to a hotel around here this May. This town must treat him well since he seems to frequent it more than anyplace else. But just in case anyone is curious, I will pass on the May concert. I had a great experience, but I can't hog the poor man all to myself.